No need to call the service technician when you can follow this guide to replace the Dell 2400MP projector lamp. When the lamp light blinks amber, it’s time to replace the Dell 2400MP projector lamp. The message “Lamp is approaching the end of its useful life in full power operation. Replacement suggested!” will also appear on screen. Don’t wait too long to change the lamp. Pushing it too far can result in the lamp making a loud popping noise before burning out. When the message “Lamp Defective” is on screen the Dell 2400MP projector will not turn on. 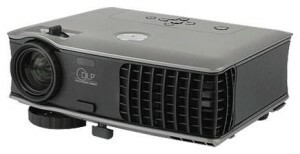 The Dell 2400MP projector needs an OEM Dell 310-7578 projector lamp to keep working at its optimum best. Avoid generics. Knock-off lamps are not calibrated properly so they can damage the sensitive optics in your Dell 2400MP projector. These lamps don’t save you money since they have a much shorter life and present a health hazard and are prone to explosions. Copycat manufacturers also offer no guarantee or refunds. Save yourself hassles and protect your Dell Dell 2400MP projector from being damaged, buy OEM Dell 310-7578 projector authentic projector lamps! Before replacing the Dell 310-7578 projector lamp be sure to turn the projector off and disconnect from the AC plug. Let the projector cool down for at least 30 minutes. It should be cool to the touch. Don’t attempt to change the lamp when the projector is still hot as there is a good chance you can get severely burned. Place the Dell MP2400 on a soft surface and turn in upside down to access the projector lamp cover. Loose the two screws that hold the projector lamp cover in place. Loosen the two screws that secure the projector lamp. Pull the projector lamp up by its metal handle. Pulling too quickly can cause the bulb to shatter. NOTE: Don’t throw the Dell 310-7578 projector lamp into regular garbage! Since it contains mercury, this lamp must be properly recycled. Install the new Dell 310-7578 projector lamp making sure it is properly aligned into the projector. Tighten the two screws that secure the Dell 310-7578 projector lamp. Replace the projector lamp cover and tighten the two screws. 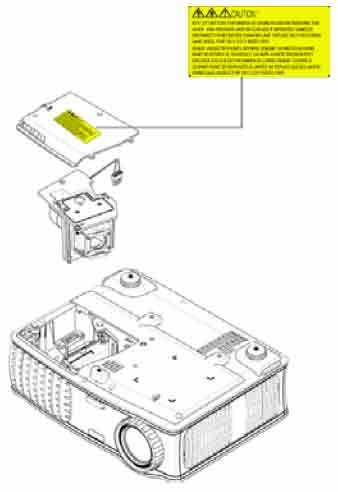 The Dell 2400MP projector tracks the life of the Dell 310-7578 projector lamp and will trigger the warning signals when it’s time to replace. Each time you replace the projector lamp you must reset the lamp timer to zero. Failure to do so can result in you using the projector past the optimum lamp life and causing the projector lamp to explode. To access the Main Menu press the left or right buttons on your projector’s control panel or remote control. Scroll over the the LAMP Menu. Press ENTER to access. Scroll down to the Lamp Reset icon. Press ENTER. 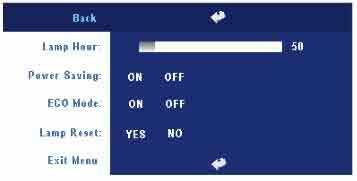 Scroll down to choose YES and press ENTER to reset the projector lamp timer. From the LAMP Menu, choose ECO MODE: Select On to use the projector at the lower power level of 165 Watts, which makes the Dell 2400MP projector operate quieter and with lower light that gives more projector lamp life. Select off to operate at the 200 Watts power level. 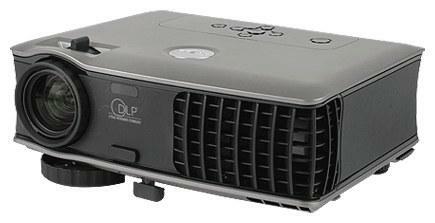 Make sure there is enough airflow around the Dell 2400MP projector particularly if it’s been permanently mounted. My projector keep a mensage like acess danied how can i fix it ? What is the make and model of your projector? What is the exact message on the screen? These time of messages are usually connected to the projector lamp reaching end of life.